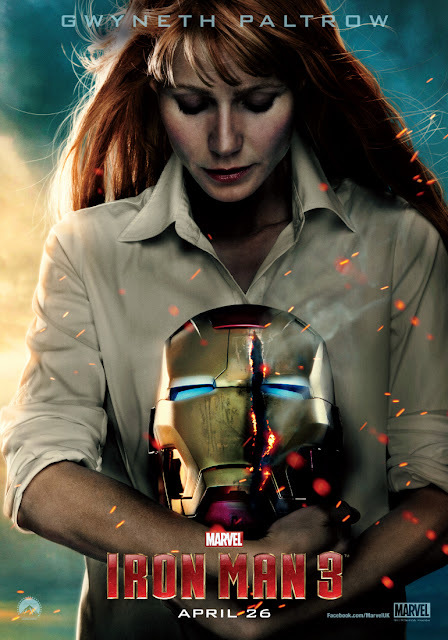 With the release of IRON MAN 3 fast approaching on April 26th 2013, we are pleased to make available the fourth character banner featuring GWYNETH PALTROW as PEPPER POTTS. PEPPER POTTS [Gwyneth Paltrow] Pepper has progressed from Tony Stark’s assistant to the head of Stark Industries, pausing along the way to fall in love with Tony as well. Bright, loyal and honest, Pepper understands Tony Stark more than anyone and sometimes that can be both a worrisome and a dangerous thing. IRON MAN 3 is set for release on April 26th 2013, and before 2012 draws to an end we can now make available a brand new image from the highly anticipated next chapter of the Iron Man franchise. The film is directed by Shane Black and stars Robert Downey Jr., Gwyneth Paltrow, Don Cheadle, Guy Pearce, Rebecca Hall and Ben Kingsely as ‘The Mandarin’. It looks like as we are being led to conclude Iron Man has taken a serious beating. This image showing his damaged helmet - is this the same helmet under Mandarin's foot in his character banner? Iron Man 3 is presented by Marvel Studios in association with Paramount Pictures and DMG Entertainment. Marvel Studios’ President Kevin Feige is producing and Jon Favreau, Louis D’Esposito, Stephen Broussard, Victoria Alonso, Alan Fine, Charles Newirth, Stan Lee and Dan Mintz are executive producers. The film releases April 26, 2013, and is distributed by Walt Disney Studios Motion Pictures.